The other day, I was at my good friend Jeff Aragaki’s (of Aracom Amps fame) home/workshop and noticed his ProLine multi-guitar stand where he always keeps five or six guitars. I was thinking to myself that I could use one of these in my home studio, as I have at least five guitars and a bass out at any time; especially as of late, since I’ve been recording quite a bit. All my guitars are on individual stage stands, and they take up a lot of space. I was thinking that with a multi-guitar rack, I could put out several guitars and not take up too much space on my studio floor. But one thing that I thought about when considering a multi-guitar stand was it would be great if there was one made of wood. It just looks better to me. And wouldn’t you know it, today I received an email announcing a new company called Rock Solid Guitar Stands that make their stands out of wood. Cool! Check this out! THAT is exactly what I was looking for in a multi-guitar stand! Two new models coming in October 2011. Is your studio, family room, or living space crowded with guitar cases or single stands? 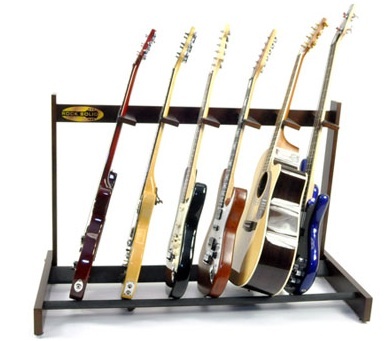 Rock Solid Guitar Stands will compliment your space, and more importantly, showcase your collection at the same time. Rock Solid Guitar Stands are multi guitar stands that were speciﬁcally designed for the home or studio and designed by a collector. Your guitars and basses will truly be at home, and ﬁnally given the attention they deserve. Unlike the typical metal multi-guitar stands out there, which are not very stable or attractive, Rock Solid Guitar Stands ﬂow quite well in any decor in your home or studio. They are also very stable. For more information visit http://www.rocksolidguitarstands.com. In October of 2011, we will be introducing “The Classic 4,” and “The Show 5.” These two new multi-guitar stand models will offer an alternative for players with guitar collections of various sizes. The Classic 4 is perfect for someone with limited space. It is only 33” wide x 28” high x 18” deep. The Show 5 is truly a unique design. Let’s face it, you want to show off your favorite guitar and have it accessible at all times. That’s why The Show 5 has a specially designed ﬁfth slot which let’s your most precious guitar stand out and get some extra loving! The stands come in three different colors: Honey, Dark Cherry, and Ivory. Personally, I like the Dark Cherry color. Also, they only weight 12 lbs. ; not at all heavy, which is cool. The price is $199 direct, which might be a bit steep, but these are solid wood, not press-board. When you order one, assembly is required, but an allen wrench is provided and you’ll just need an adjustable wrench or pliers. From what I gather, the kit takes less than a half-hour to assemble. Those are pretty nice. I was looking at them a few years ago, but I have no floor space. I wound up taking all the pictures off my wall and buying hangers. I staggered them at different heights so the bodies look like they can fit together if pushed closer to each other. Even my wife thinks it looks good. Hey I love this page that you created. Nice stand also.